We humans love to split things. Disney may tell us it’s a small world, but that doesn’t stop us from cleaving it up into ever smaller pieces. Whether it be the borders of the continents, countries, provinces, states, counties or cities, we love to draw lines on a map. There is probably even a few lines in your home town that you won’t find on any map. In Toronto, Yonge street runs from the southern most point at Lake Ontario all the way through the city and beyond, providing a nice little line to split the city into two pieces. I always lived right close to Yonge Street when I lived there, and I admit that I found something vague distrustful about those that lived east of Yonge (even though I lived east of Yonge street, though only by a few blocks). 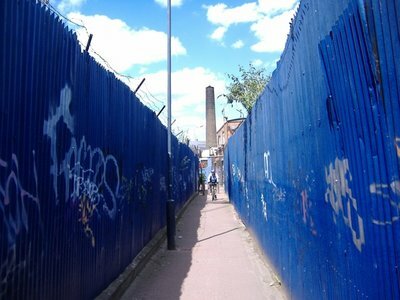 People in the east end seemed to be more hippy-dippy, granola eating folks, whereas those in the west end always seemed more conservative, traditional, roast-on-Sundays types. 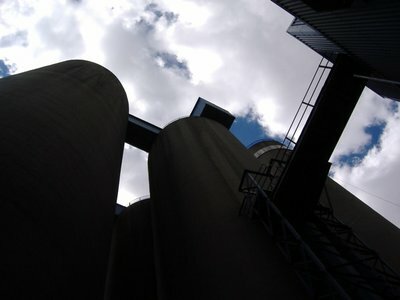 Taking it a step further was London, Ontario (I’ve lived in two different Londons in my life). 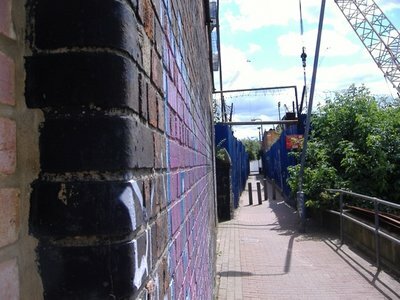 One of the prime north-south streets was Adelaide Street. For those of us living west of Adelaide, crossing Adelaide was going over to the “other side of the tracks.” There was even a shorthand for it - EOA. If you said someone was EOA that’s all you needed to say. It implied they were backwards and trashy. Of course, those are examples are completely stereotyping and wrong, so now that I have told them to you, promptly forget them as being nothing more than outdated, politically incorrect labelling. Sometimes, though, cutting up the world into lines makes a lot of sense. This is especially true for those that set sail into the dark waters of the Atlantic and Pacific Oceans. Long ago we figured out how to divide the world into a east-west running grid called Latitude that would give on their position north or south of the equator. Latitude lines run parallel, which means there is always the same amount of distance between them, no matter where you are on the earth. Defining Latitude was easy, as there is a really obvious point to start with, or rather two points, the north and south pole. One could easily measure there Latitude, as a navigator could determine his latitude by observing the height of the sun during the day and the North Star at night. Longitude was more tricky, though, because there is no obvious reference points, nor any obvious astrological signs to go by. Lines of longitude run from pole-to-pole, so the distance between them widens as you get close to the equator. To measure how far you’ve travelled east-west, you needed two things - a really good watch and an agreement on where 0 degrees should be (i.e. where to start measuring from). In 1884 the International Meridian Conference met in Washington, D.C. and decided to use the Meridian that the British Royal Navy had been using on their maps, which just happened to run right through the Royal Observatory in Greenwich, England. 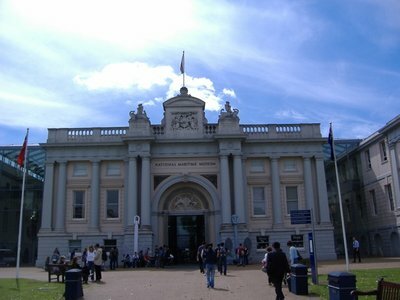 The Royal Observatory is now part of Greenwich Park, which includes parts of the old Naval College which is now part of the University of Greenwich and the London Maritime Museum as well. I wandered down to Greenwich on a typically sunny English day (seriously, I think this whole rain thing is just something they said to keep the tourist away. They are now saying that it’ll not rain at all for the next two weeks, which is important for England as it is Wimbledon time - more on that in a future entry, though). 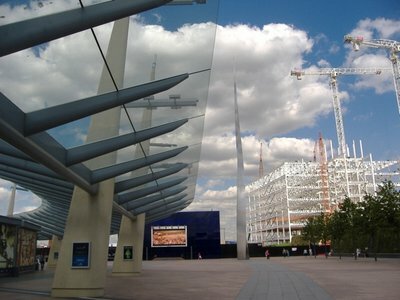 From the Cutty Sark Docklands Light Rail stop, Greenwich Park is just a few steps away. 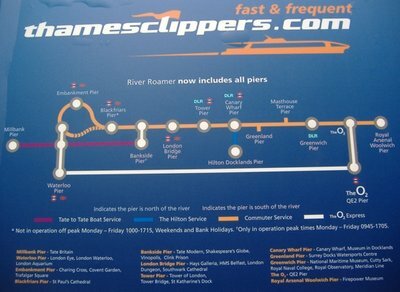 The Cutty Sark clipper ship is also on display there, thus explaining the name of the rail station, however it is currently under repairs until 2009 so all you can see is a big, white tent. I guess if you use your imagination, you could pretend that you are looking at the Cutty Sark with her sails draped over her deck to dry them out, obscuring your view. 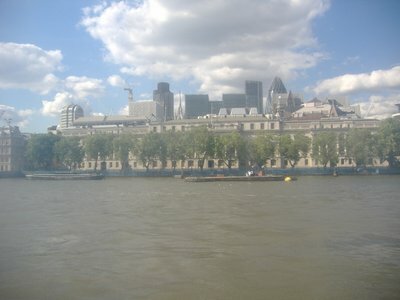 Anyway, leaving my imagination and back to reality, the buildings closest to the water are old Naval College buildings and a sailors’ hospital. 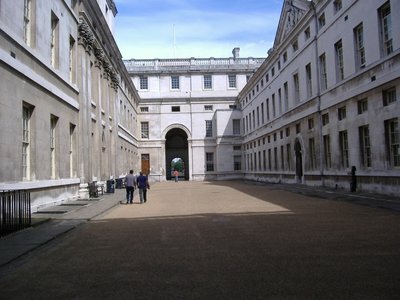 Today the buildings are used mostly as halls for the University of Greenwich. This courtyard is in the music department, so standing here I was treated to piano, cello and violin music wafting out of open windows. 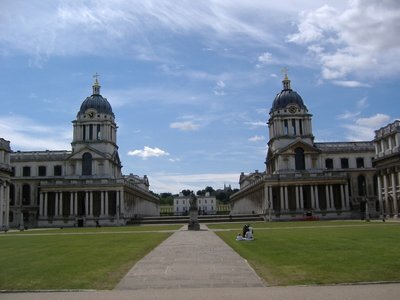 Two of the buildings of interest to tourists are the Painted Hall and the Chapel. 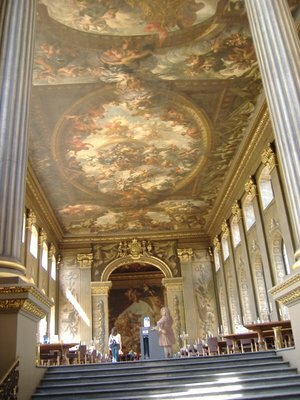 The Painted Hall is called such because of the big hall which has a big mural on the ceiling. I’m surprise more people don’t fall down the stairs when walking out, as it’s hard not to walk around without your head tilted all the way back to take in the mural. The Chapel is a church, and as such has dead people buried in it. Heading south you come to the Maritime Museum, which has a number of exhibits of sailing and such, including an interesting one sponsored by P&O Cruise lines on the “golden age” of trans-Atlantic journeys by boat. It also has the actual coat that Lord Nelson was wearing when he got shot. 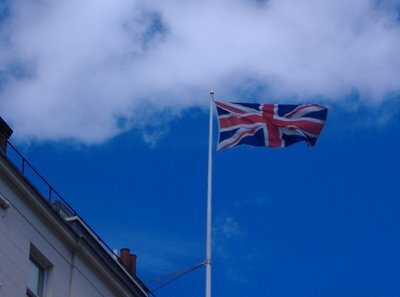 Standing on the deck of HMS Victory, Lord Nelson glanced up at a lookout high in the rigging and called, "Keep a keen eye out for Spanish sail, my lad. For today, I feel like a fight." Soon, the lookout cried, "Sail ho, off the starboard bow!" Nelson pointed his spyglass in the direction indicated, and - sure enough - there were two Spanish frigates off the starboard bow. 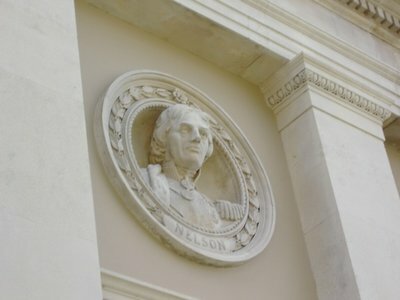 Realising that his ship was in for a tough fight, Lord Nelson turned to a young officer. "Ensign, fetch my red coat!" A few minutes later, the Ensign returned with the coat. As he held it out for his Admiral to wear, he said, "Begging your pardon, My Lord, but why do you need your red coat?" Nelson smiled grimly. "There'll be much blood spilled today, Son. And some of it might well be mine. If it should happen that I am wounded, my red coat will hide the blood. Then, our own men will take heart from seeing their commander apparently untouched, and our enemies will fear my invincibility." The Ensign nodded, seeing at once the wisdom of the Admiral's reasoning. The battle was long and difficult, but Nelson eventually won the day. A few days later, a lookout shouted down, "Sail ho, off the port beam!" Nelson pointed his spyglass in the direction indicated, and found himself staring at the entire Spanish Armada. Hundreds of ships bearing down on his lone ship like angels of death. Anticipating his Admiral's next order, the young Ensign said, "Shall I fetch your red coat, Sir?" 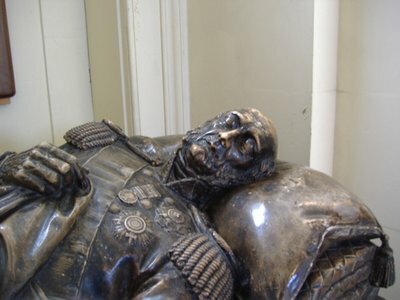 Nelson nodded. "Do that, Son. And while you're at it, fetch me my brown trousers!" 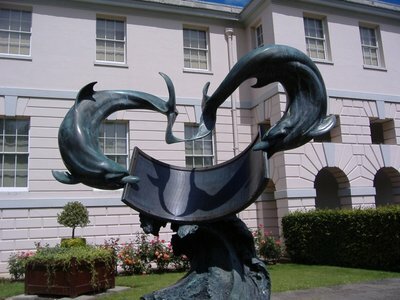 Behind the museum is this statue of two frolicking dolphins that also acts as a sundial. It works to, I checked it against my watch. I said so long to the dolphins, to which they replied “So long, and thanks for all the fish,” and then I made my way up a long hill to the Royal Observatory. 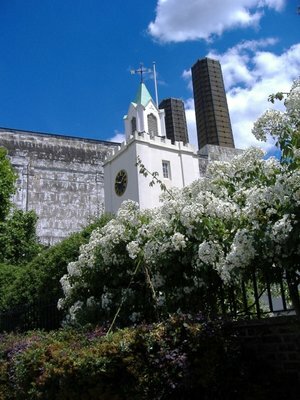 The Royal Observatory was commissioned in 1675 by Charles the Second, who also said it shouldn’t cost more than £500 to build, so they built it using stone from the Tower of London and from Duke Humphrey's Tower. The first Royal Astronomer was John Flamsteed, who set up a telescope and started mapping the heavens. The point where he set up his telescope became the meridian he used on all his star maps. As new Astronomers came in (and out) of the position and the Observatory grew, telescopes were located in different locations, each time changing the spot of the meridian. 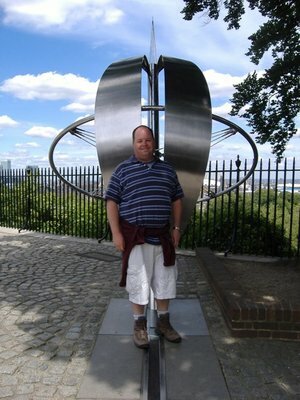 Finally, in 1851 Sir George Airy establish the “Prime Meridian,” that went on to be adopted world-wide in 1884. Well, except for France and Brazil, but eventually they caved. Can’t keep a good idea down for long. Also at this conference, Sir Sanford Fleming, the Scottish-born Canadian who was the primary engineer on the Canadian Pacific Railroad proposed that the world adopt “Standard Time” and time zones. The resolution wasn’t passed, in fact it wasn’t even voted on, but like the prime meridian, it was a good idea and eventually was adopted. And that led to the invention of my cool Eco-drive watch with built in time-zones, so I’m happy about that. 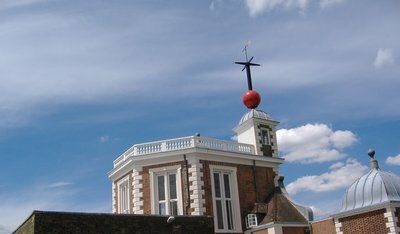 The Observatory has a time ball on top of it’s roof. It’s the big red ball in the photo below. 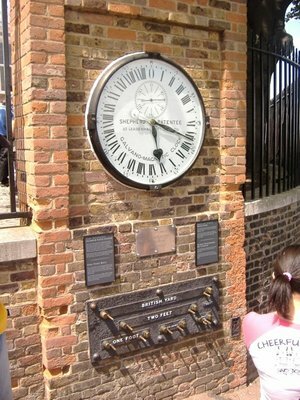 After the eventual adoption of time zones, to help others synchronise their clocks to GMT, this time ball was installed by Astronomer John Pond in 1833. 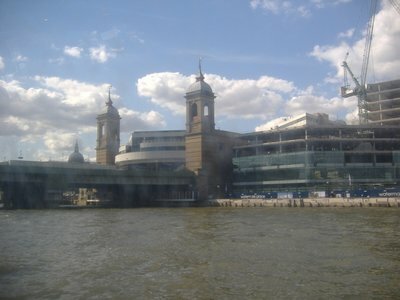 It was easily viewed from the River Thames, and would allow sailors to synchronise their watch to GMT when the ball dropped every day at 1 p.m., as it still does today. 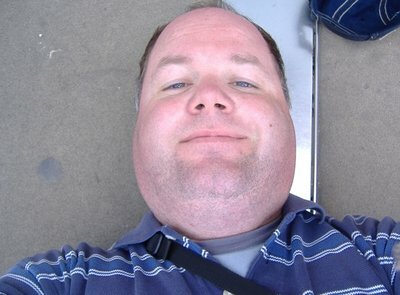 Here’s the obligatory shot of me standing on the Prime Meridian. I had to line up for 20 minutes to get this damn shot, but I would have kicked myself if I didn’t. Here’s a shot that I didn’t have to line up for at all, I just had to lie down. Nice shot, but it does make my face look really fat. This shot and my fat face would prompt me to walk a fair bit today, so it probably did something good for my cardio-vascular system if nothing else. You know, it’s interesting how we in the “Western World” call it that when really, a fair chunk of it is in the east. Most of Europe is east of 0 degrees. It’s almost like we in the “Western World” wanted to squeeze out the rest of the world, so we didn’t even give them half the planet. This is probably one of those things like being EOA that I mentioned at the start of this entry, us on one side of an imaginary line trying to put down those on the other side. Those of you with Google Earth or who have been to the site of the Royal Observatory with a GPS unit may be wondering why the Prime Meridian line doesn’t line up with 0 degrees. There’s a nice little explanation on the Google Earth blog about it, but the basic reason is that when GPS was created they created a mapping system called World Geodetic System 1984. GPS uses triangulation from three satellites to determine your position. Because the earth is not a perfect sphere, however, so the WGS84 uses a “best fit” approach, shoe-horning you in where it can. Unfortunately, one of these best fit scenarios wound up placing the GPS’s Prime Meridian 100 metres off of the Royal Observatory line. Anyway, there is apparently nothing to mark the GPS84 meridian on the site except a garbage can on a footpath, so it’s much better to take your pictures on the nice, metal line in the cobblestones at the Royal Observatory. 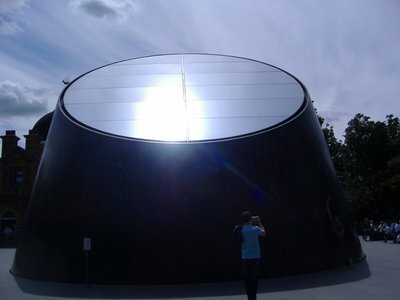 Here’s an arty shot I took of one of the newer buildings on the Royal Observatory grounds. I liked the way that the sun was reflecting back at me. Heading east from the Royal Observatory and the Prime Meridian (does that mean I am in the Orient now? 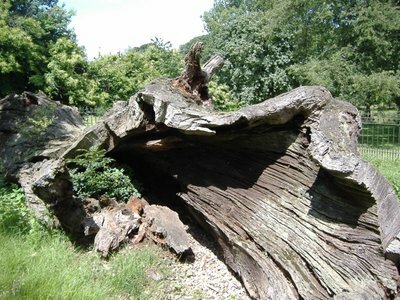 ), I came across Queen Elizabeth’s Oak. It is called as such because the folklore is that Henry VIII sported with Anne Boleyn under its branches and their child, the future Queen Elizabeth used to play in the tree. The tree fell down a few years ago, so the current Queen Elizabeth (number 2 of a yet undetermined set) planted a new oak tree. After taking a gander at the royal oak, I went and saw something which was tantalisingly described as “Roman Ruins” but ended up just being a small rise in the grass. It was fenced in, though, which means all you could do was look at the small rise in the grass, you couldn’t even walk up it. 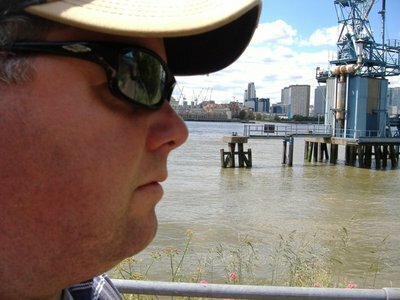 From there, I headed back downhill to the River Thames. 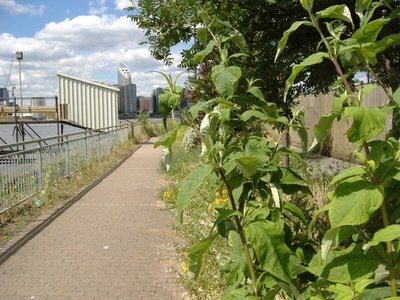 I had two choices, one to take a pedestrian footpath under the river, which I must admit really intrigued me, or head along the Thames Path eastward. 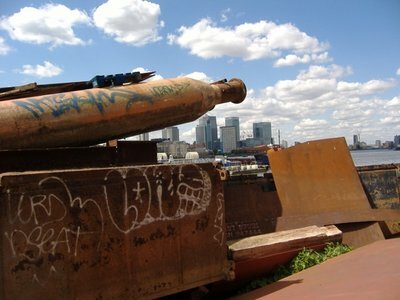 I chose, for reasons that mostly had to do with the fact that I was already east of the tunnel under the Thames, to continue farther east. 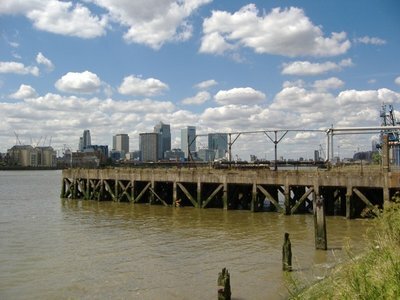 The Thames Path, for those that don’t know, is a 294 km path that follows the banks of the River Thames from its start in the Cotswolds to the Thames River barrier in London. It is for the most part a lovely place to stroll. 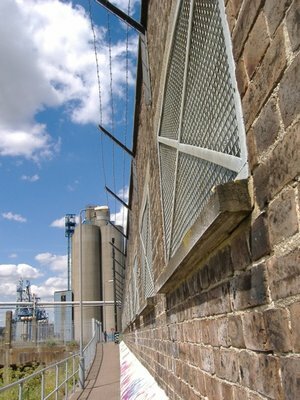 ...you get into some really derelict and industrial areas. 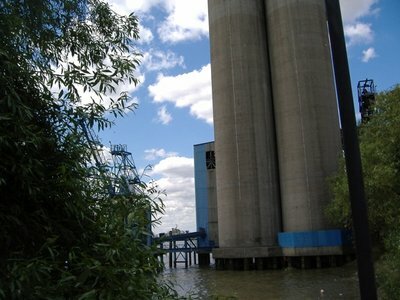 This is not the most idyllic part of the River Thames. At one point, I had to wait for a crane operator who was unloaded gravel to move his crane across the path to let me pass. The giant shovel was raining little, round pebbles of gravel onto the path, which is why it is wise to wait for him to signal. I picked up one of the pieces of gravel and it (along with all the other’s split onto the path were almost perfectly round, like marbles. I wonder where perfectly round gravel comes from? 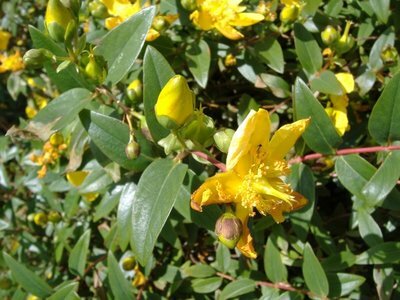 There is, though, a kind of beautiful charm to the rusty stuff, and a few bits of nice, if somewhat weedy and overgrown, nature along the trail. 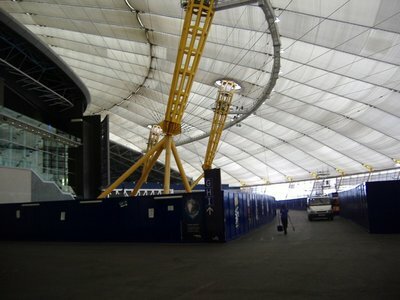 After getting glimpses of it as I was walking, I finally arrived at The O2. 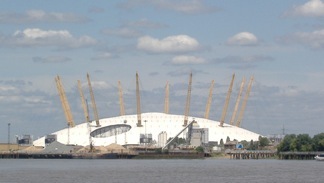 The O2, originally commissioned as the Millennium Dome but renamed after a mobile company sponsored the place is a multi-purpose entertainment venue and shopping plaza. My first memories of seeing the place were last year when the NHL hosted two regular season games in England, trying to spread the appeal of the game to a worldwide audience. 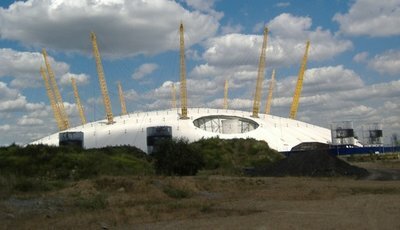 I remember thinking that it looked very industrial, but after walking along the Thames Path towards the dome, it started to make a lot of sense. It fits very well into the area, like some sort of futuristic cargo terminal. 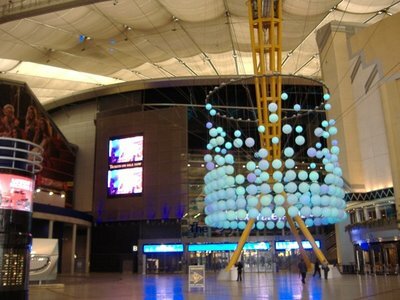 Arriving from the tube or DLR, though, and you wouldn’t see how the industrial beauty of The O2 fits into the surroundings, as the entry plaza from the tube station into The O2 is quite impressive. 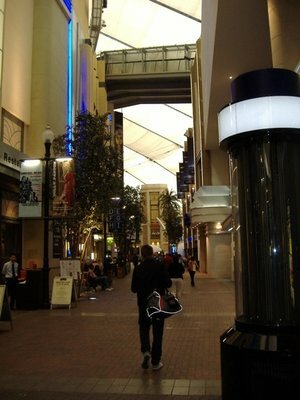 Inside there are a number of shops and restaurants, as well as two entertainment venues and an exhibition space. I had some chicken wings at the American Bar & Grill and contemplated my next move. Part of me wanted to walk on to see the Thames Barrier, a giant floodgate that can close and protect the cities from floods, and while my mind seemed up to the mile and a half walk, my legs were not. 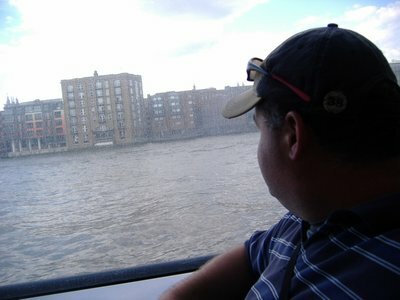 I could have easily got on the tube at the O2, as the Jubilee line which my flat is on (all the way on the other end of the city, and in the “west”), but decided to splash out £4 and take a fast ferry back. 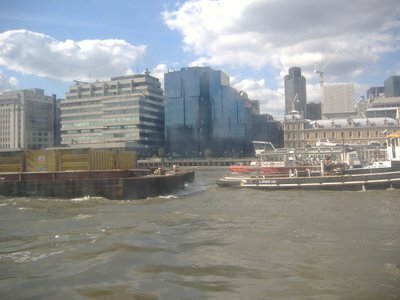 The Thames Clippers run along the Thames from Woolwich in the east to Embankment in the West. 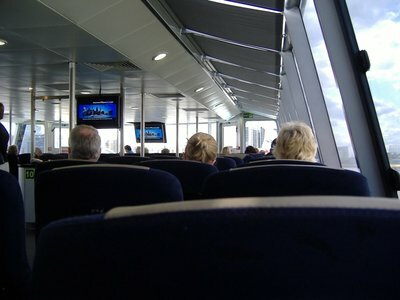 It’s not really a tourist boat though, so space outside is limited and instead there’s lots of comfy seats inside. You do get some nice views of the London, and I took a few snapshots, but the windows were really dirty so they didn’t turn out that great. 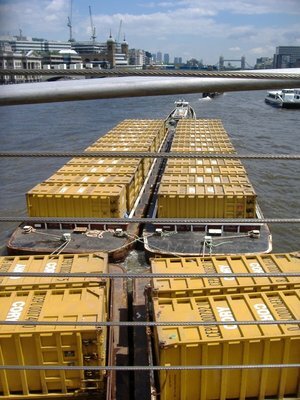 And of course, when you travel on the Thames, every once and a while you have to pass a garbage scow. That’s when you’ll be happy you’re inside. Thanks for exploring! Especially for those of us who are currently sporting a pretty gnarly case of cubical fever!